This exhibition of 100 pieces of ikat, mostly collected by Monique and Rémy Prin between 1985 and 2018, reveals exceptional fabrics that are emblematic of a fascinating craftsmanship from Asia to Europe including Indonesia, Japan, India, France, and Spain. Beyond showing the diversity of ikats, this exhibition details the evolution of their role and perception within the cultures that created them, from sacred fabrics related to founding myths to cloth made for mass diffusion in the Western world. The word “ikat” refers to a dyeing technique that, in order to pattern textiles, employs resist dyeing of the yarns prior to weaving the fabric. This complex dyeing and weaving process create patterns with vibrant designs. Through this technique, weavers created an aesthetic richness that was often at the heart of their traditions and beliefs. Image: Pua kumbu batang limau senaman Ritual fabric. Malaysia, Sarawak, Rumah Gare; Iban ethnic group; 2016. Cotton, warp ikat. Munisak, woman’s coat. Uzbekistan, Samarcande ; 19th century. 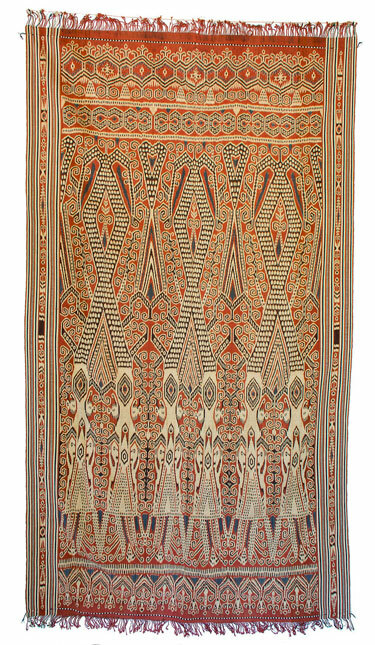 Silk, warp ikat. Merchant at the bazaar of Margilan, Uzbekistan; 2011. Photo credit Sylvie Jadeau. Pitumarca replica of the Shroud of Gothenburg. The Andean culture of the Paracas (about 800 BCE and 100 BCE), spurred an unprecedented explosion of innovation in the textile arts. 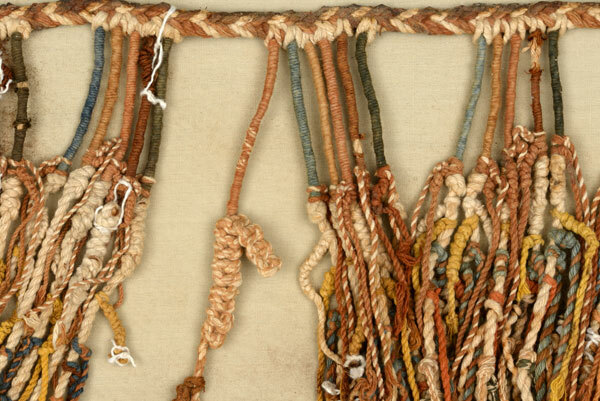 With the fall of the Inca Empire, however, many pre-Colombian textile techniques were forgotten. 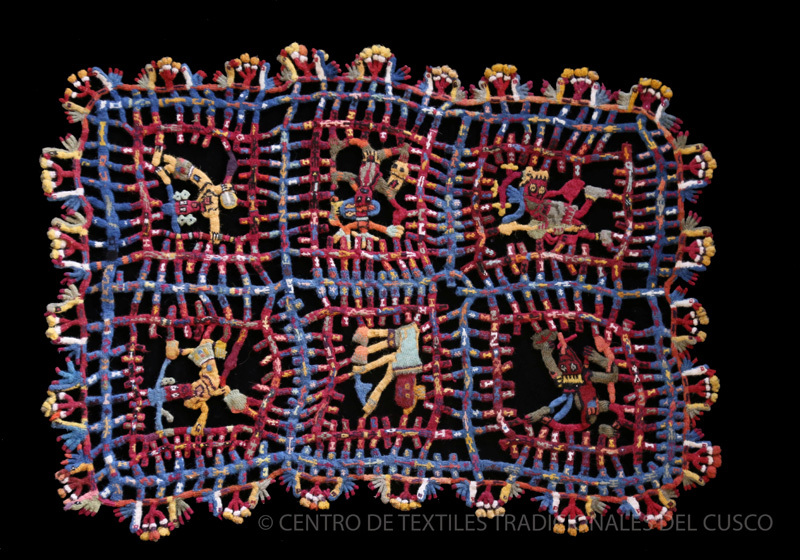 Today, the weavers from the Center for Traditional Textiles of Cusco are working to recover cross-stitch looping, a complex three-dimensional embroidery technique that both the Paracas and Nazca used in the borders of their textiles. Discover the mysterious story behind the Shroud of Gothenburg, one of the most important textile that exists in the world, and learn how modern weavers are recovering the knowledge of their ancestors stitch by stitch. Kanga from Kenya typically have three design elements: central motif, border, and a proverb or saying usually in Swahili. A Diverse Continent showcases thirty-six textiles from eighteen countries representing the diversity of African culture and textile-making traditions. Africa is the most diverse continent in the world, both in its biodiversity as well as in its ethnic groups. Its textiles are similarly diverse in terms of material and method. Materials ranging from raffia palm fiber to silk to recycled wire are expertly woven, knit, knotted, plaited, embroidered, beaded, stamped, painted, and dyed to create a staggering variety of textiles. A Diverse Continent will feature two dozen unique textile-making traditions from across Africa, encapsulating one facet of the continent’s staggering diversity. The Japanese have long had a deep appreciation of colour and a close relationship with their natural surroundings and the changing of the seasons. This exhibition shows how the work of the Yoshioka Dyeing Workshop in Kyoto has expressed the careful creation of colour combinations and how Yoshioka has studied and developed Japan’s age-old natural dyeing techniques. Through a series of colour combination displays, each communicating a specific seasonal message, the exhibit recreates the language of kasane, a concept of layering colours. Coinciding with London Craft Week (May 8-12, 2019), Japan House is hosting a series of themed events. The beginning of the 21st century has brought a revival in natural dyes as urban dwellers rediscovered nature as the answer for achieving solace and harmonious living. Today, many international communities are advocating the use of natural dyes in modern practices and promoting research on ancient dyeing techniques. In recognition for these artistic and scientific endeavors, the China National Silk Museum (CNSM) has organized the first biennale of natural dyes, with an aim to celebrate the beauty of colors in nature, as well as to explore the ancient wisdom and knowledge embodied in the traditional craft of dyeing. Registration is underway for exhibitions, symposium, workshops, market, and study tour. A humble act first born of necessity, repair is an expression of resistance to the unmaking of our world and the environment. Repair and Design Futures is a multidisciplinary exhibition and programming series that investigates mending as material intervention, metaphor, and as a call to action. 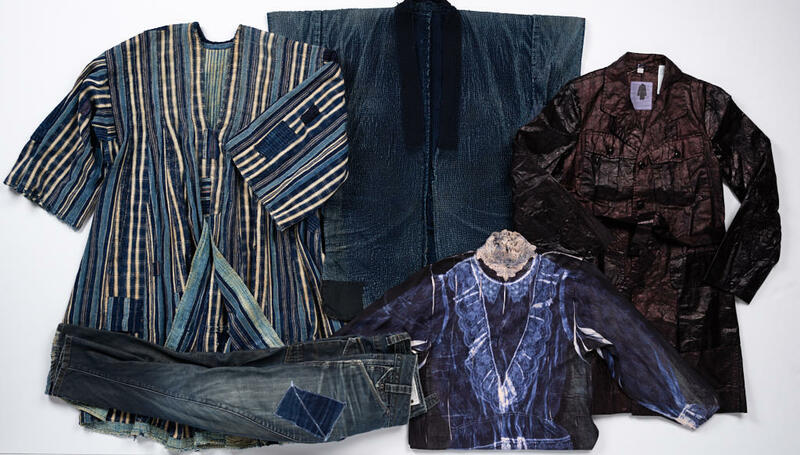 Objects range from Japanese boro garments and Indian Kutch quilts to a hunter’s ensemble from Mali, a Naskapi caribou coat, Swiss worker’s trousers, and fashionable and utilitarian American clothing. Japanese, Katagami: chrysanthemums, probably Meiji era (1868-1912); mulberry paper treated with persimmon tannin, reinforced with silk thread. 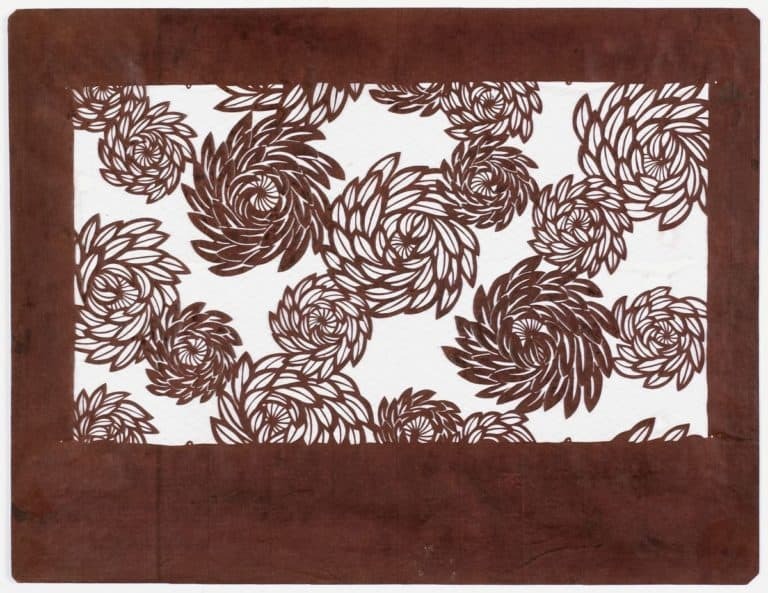 The Japanese have printed fabric for centuries using katagami, hand-carved mulberry paper stencils. These stencils’ intricate designs and bold style amazed the European and American artists who encountered katagami at the turn of the century, including architect Frank Lloyd Wright, whose library from the Little House is on view at the Museum. This selection of katagami from the collection highlights their appealing designs and cross-cultural history. One: Egúngún tells the life story of a twentieth-century Yorùbá masquerade dance costume (egúngún), from its origins in Ògbómọ̀ṣọ́, Nigeria, to its current home in Brooklyn. 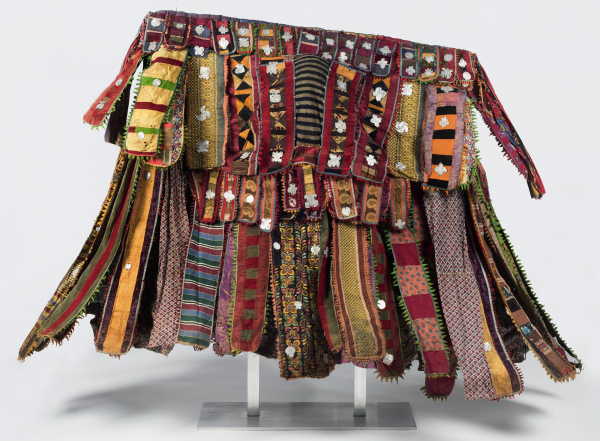 Composed of over three hundred textiles from Africa, Europe, and Asia, this egúngún swirls into motion during festivals honoring departed ancestors. Centuries old, egúngún is still practiced in Nigeria, the Republic of Benin, and in the Yorùbá diaspora. Selvedge Magazine will be partnering with the International Folk Art Market to bring a version of that event, The Selvedge World Fair, to London. 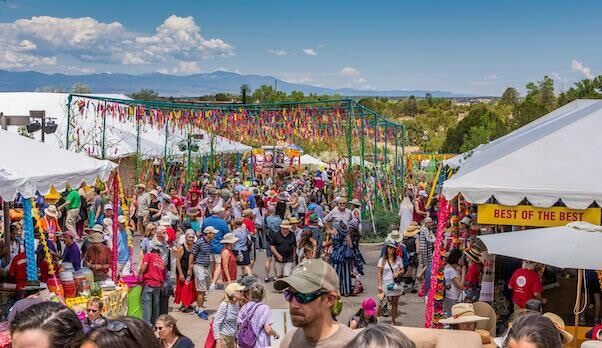 Presented by the not-for-profit Selvedge Foundation, this special event will be a three-day celebration of textiles and more, where world-renowned artisans will share their skills, show, and sell their work. The impact of an event of this nature is tremendous as it supports the creative economy by preserving endangered crafts. In order to bring the Selvedge World Fair to life, the Foundation needs to raise funds to cover the costs of the event and to enable artisans to travel to and stay in London. Please consider donating to this very special campaign. Every donation received, large or small, will bring the Selvedge World Fair one step closer for staging this extraordinary event. Join Nancy Hoskins, an authority on Egyptian textiles past and present, as she and tour concierge Christine Pearson expertly guide the textile program to Egypt along the Nile Valley. 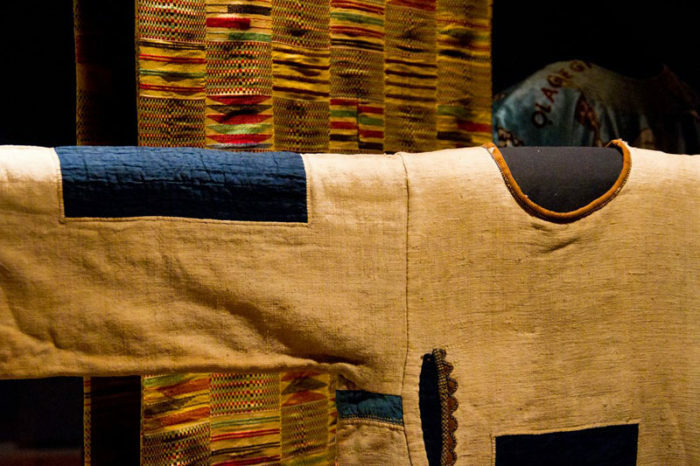 Together with numerous interactions with weavers, carpet makers, embroiderers, and Nubian village crafts people, Nancy will explain the intricacies of historical garments and textiles found in museums and galleries. 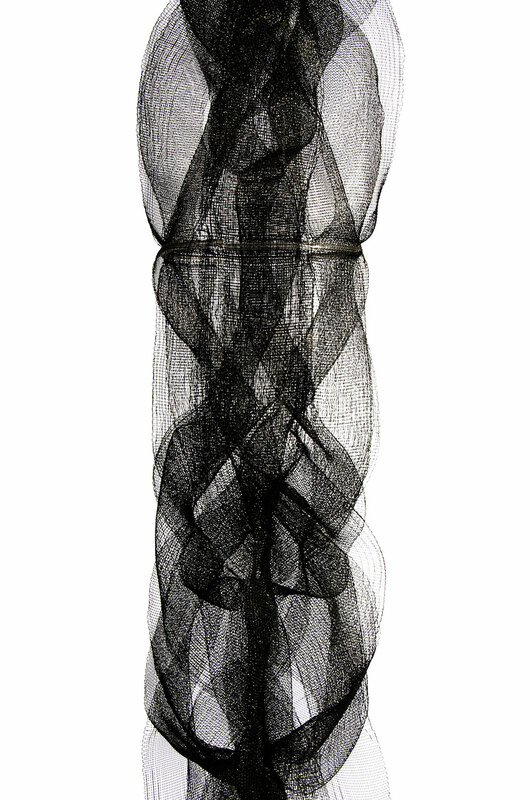 The expanse of fiber craft covers fine museum examples to the everyday items found in markets and elsewhere. Accommodation is very characteristic and comfortable in Alexandria, Cairo, Luxor, and Aswan, with a highlight being a five-day, Edwardian-era dahabiya cruise along the Nile, calling in at the famous sites found nearby. The ten-cabin craft includes comfortable cabins, all meals and private sightseeing, thus avoiding the crowds. The luxurious Wari and Inka tunics in this exhibit project the worldviews and ritual behavior of each society’s most powerful social actors. Presented alongside the special exhibition of Written in Knots, this installation examines the relationship between two components of the Andean woven world, tunics and khipus. Although different in function—tunics were worn as clothing and khipus encoded and transported information—both types of textiles are made of the same materials, produced through many of the same techniques, and tell stories about their owners. Long before the arrival of the Spaniards, the people of South America had a system of recorded information that was portable, precise, and so complex that it remains undeciphered today. The long-lived Wari Empire and vast Inka Empire employed sophisticated devices called khipu to record information, such as census data and tax records. Made of cords, both Inka and Wari khipu seem to have recorded not only quantitative or statistical content, but narrative information as well. The variation in cord structures, colors, wrapping patterns, and knots encoded and conveyed information, while the basic khipu elements—flexible knotted cords—offered a lightweight and compact means of transporting information across distances. Image PC.B.497 Tunic; Wari, Middle Horizon AD 650-800; 119.5 x 112.1 (47.1 x 44.1); wool, cotton. Image PC.B.498 Tunic; Wari, Middle Horizon AD 650-800; 111.5 x 104 (43.9 x 40.9); wool, cotton. 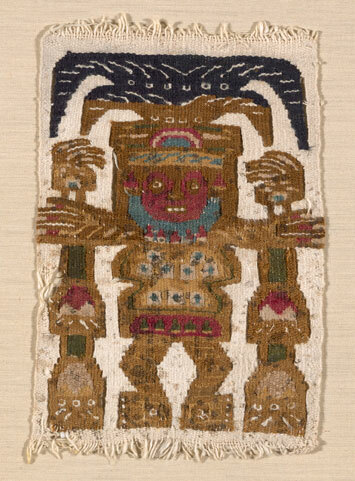 Image PC.B.500 Tunic; Wari, Middle Horizon 650-800 CE; 101.3 x 100 (39.9 x 39.4); wool, cotton. Image PC.B.501 Fragment Of Tunic with Felines and Festival Goers; Wari, Middle Horizon 650-800 CE; 151 x 112 x 34.4 (59.4 x 44.1 x 13.5); wool, cotton. Image PC.B.505 Provincial Tunic; Inca Provincial, Late Horizon; 1450-1540 CE; 87.9 x 72.4 (34.6 x 28.5); wool, cotton. Contemporary Muslim Fashions is the first major museum exhibition to explore the complex and diverse nature of Muslim dress codes worldwide. First exhibited at the DeYoung Museum in San Francisco, this pioneering exhibition examines how Muslim women—those who cover and those who do not—have become arbiters of style within and beyond their communities and, in so doing, have drawn attention to the variations and nuances of their daily lives. Spotlighting places, garments, and styles from around the world, the exhibition focuses on clothing that responds to individual and collective interpretations of modesty. It considers how Contemporary Muslim Fashions takes a look at parts of the globe where designers are creating and consumers are wearing highly fashionable garments, with a specific focus on the Middle East, Southeast Asia, and diasporic communities throughout Europe and the United States. 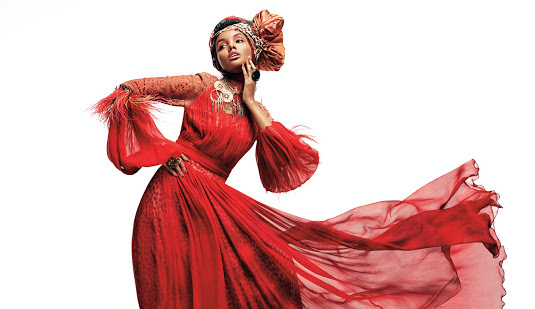 Image: Halima Aden wears Melinda Looi, for Melinda Looi (est. 2012, Malaysia). Photo credit: Sebastian Kim. This exhibit offers a rare opportunity to see ancient Andean textiles (c300BC to c1400AD) from the Whitworth collection alongside textiles from the collector Paul Hughes. As well as celebrating breathtaking achievements in textile technique and design, this exhibit explores the complexities of their transition from local ritual to a wider international stage. Image: Tunic (Cushma), Wari culture, Southern Andes, alpaca wool, c800 AD, 251x155cm. Courtesy: Paul Hughes Collection. In November 2006, the People’s Government of Wangdian Town, Jiaxing, Zhejiang Provenance discovered an ancient tomb while leveling the mound, Lijiafen. The joint tomb was identified as that of Li Xiang (an administrative official from the middle and late Ming Dynasty (1368-1644)), his wife, and two concubines. Large quantities of textile objects were discovered on site, including a considerable number of silk costumes. 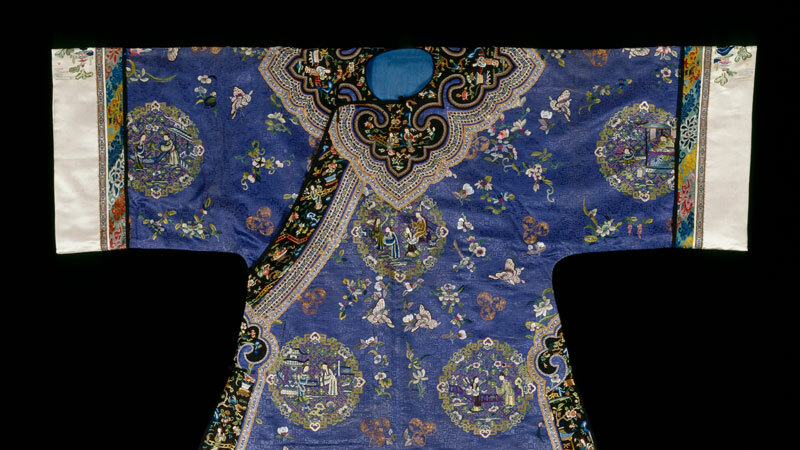 This exhibition mainly displays silk costumes unearthed from the tombs of the Li family showing a glimpse of the prosperity of silk industry in Wangdian in the Ming Dynasty. Through demonstrating the two parties’ repair and restoration technique operated in this batch of costumes, a better understanding of the costumes’ replication techniques is provided, which may also assist contemporary people in comprehending the fashion design methods and manufacturing technique of that time. 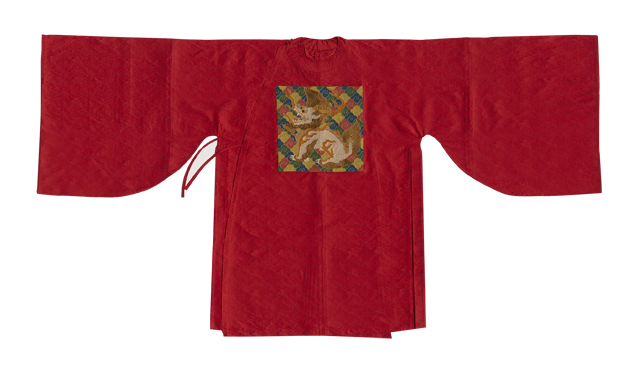 Image: Embroidery Yunhe group Shou pattern; silk; large-sleeved shirt restoration; Reproduction of big sleeve robe in twill damask with haechi badge. 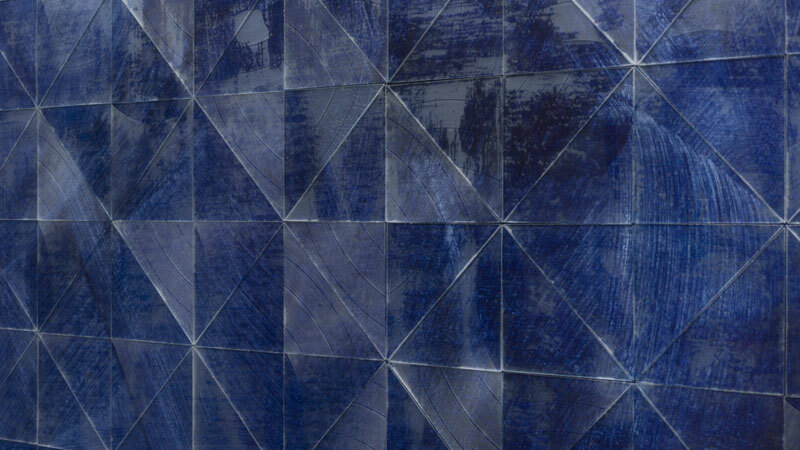 The Arvind Indigo Museum will host its first exhibition, Alchemy, inviting contemporary artists and artisans to experiment with indigo in new and innovative ways. An expansive, dedicated space is set to follow later this year which will become the collection’s permanent home. This future home promises to tell the incredible story of indigo — a natural dye which holds a special place in India’s history. Image: Gregory Hildebrandt, Untitled, 2018; photo courtesy Galerie Isa. 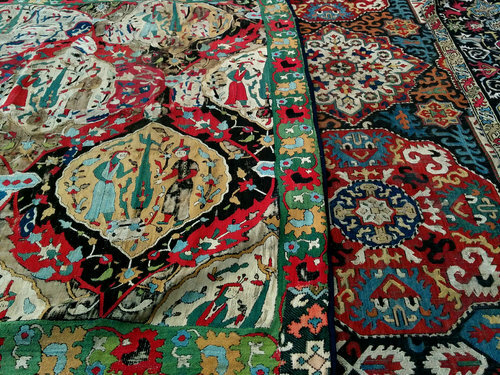 Registration is now underway for the week-long celebration of HALI’s 200th edition and 40th year inclusive of the HALI Symposium with nine lectures on the topic of “Making the Past Present: collecting and collections of antique carpets and textiles”, plus other events, a textile fair, and tours. Textiles in England. The program provides unprecedented entry to institutions and private collections outside of the capital: Historic textile mills and grand buildings are testament to Manchester’s might during in the industrial revolution, and one of the most important collections of antique textiles in Britain can be found at The Whitworth Museum. View Greek Island embroideries and Coptic textiles, collected by a tight-knit network of Victorian and Edwardian archaeologists and adventurers, before visiting three more university museums later in the week. 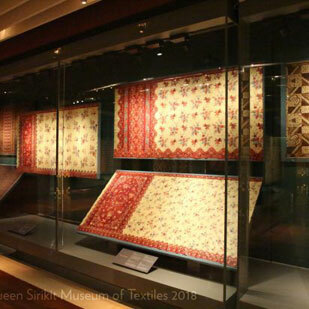 Tour the textile highlights on display and in the stores at the Fitzwilliam Museum in Cambridge, and at Oxford’s Ashmolean and Pitt Rivers Museums. Three spectacular houses contain collections, assembled in different eras, that represent the diverse artistic interests of their creators and inhabitants. Each year, many migrants perish in the region between Yuma, Arizona and New Mexico, as they try to cross from Mexico and Central America into southern Arizona. 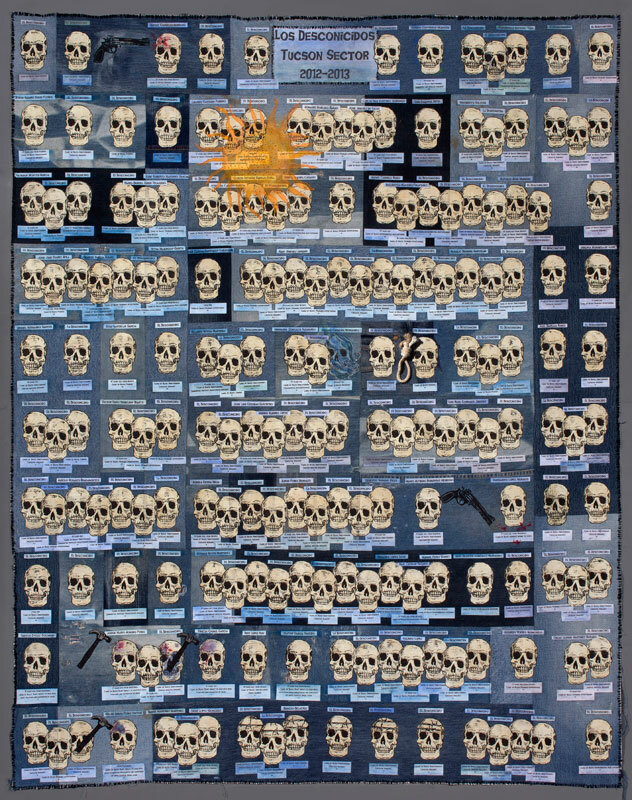 Some of their remains are unidentifiable, and these “unknowns”—los desconocidos—are commemorated, along with the others, in quilts that incorporate materials collected by humanitarians along established desert trails: blue jeans, bandanas, work shirts, and embroidered cloth. Founded by Jody Ipsen, the Migrant Quilt Project has documented the tragedy of migrant deaths since 2000 in fabric collages that blend the narrative, iconographic and typographic power of Mexican folk art, Abstract Expressionism, and Russian Constructivism. Image: Tucson Sector 2012-2013; Jennifer Eschedor, 2014; Tucson, AZ; 69 x 54 in; denim jeans, cotton fabric, milagros, ink, rope, paint, cotton embroidery thread, beads. Dressed with Distinction: Garments from Ottoman Syria explores the region’s textile production during the late 19th and early 20th centuries, when Syria was an international hub for the trade and production of handwoven cloth. With a focus on the social and seasonal contexts in which garments were worn by men, women, and children, the exhibition’s presentation of these distinguished textiles enables audiences to engage with Syrian culture and weaving techniques from a bygone era. 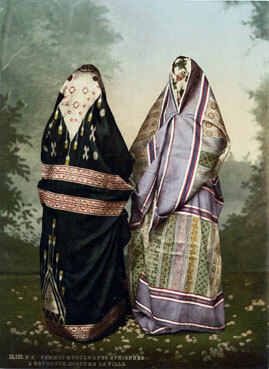 Image: “Mahomedan Women in Town Costume, Holy Land.” Photographer unknown. Photomechanical print, ca. 1890–1900. Courtesy the Library of Congress. Since time-immemorial, Coast Salish people have relied on natural resources to create textiles that communicate status, wealth, and functionality. An almost lost tradition, wool weaving has endured a revitalization over the last decade. This exhibit explores the history of the extinct woolly dog and invites visitors to learn about the fundamentals of weaving, while exploring the materials, techniques, processing, and technology. Registration for the 2019 Weave a Real Peace Annual Meeting is now underway. The theme and programming for this year’s conference is “Women and Textiles: A Path to Peace”. Join Lesley Robin in Sri Lanka and discover this tiny island nation in the Indian Ocean situated southeast of India. A cultural melting pot, it is renowned for its ancient cities, Buddhist ruins and temples, with a wonderful and diverse landscape of mountains and forests, wildlife and exotic birds, as well as the rolling hills of tea plantations and small villages of the Central Highlands. Today there is a strong revival of handloom traditions and you will find beautiful contemporary fabrics inspired by the landscape, flora and fauna of this island. A treat awaits you as we visit artisans and communities at work in their homes and villages… earthenware and clay roof tiles, batik and stitchwork, weaving and dyeing. From lowland jungles and tropical coastlines to the misty heights of the Hill Country, come and experience the beauty of this emerald island abundant with superb photographic opportunities! Native Fiber brings together a breathtaking array of work by contemporary Native American fiber artists from throughout the Great Lakes region. Comprising work of thirty-one artists and one artist guild, representing twenty tribal nations, the exhibition features an expansive definition of fiber art, from quillwork to cordage, bead work, weaving, birch biting, leatherwork, and quilting. Repeating iconography and subjects run throughout, including symbols of healing, forgiveness, women’s experiences, subjugation, and transformation. 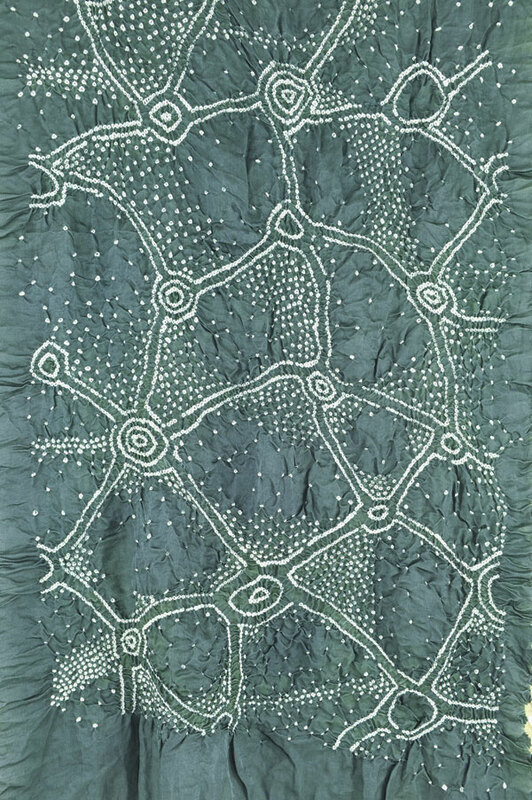 Together, the works attest to the diverse life and vitality of Indigenous fiber arts today. 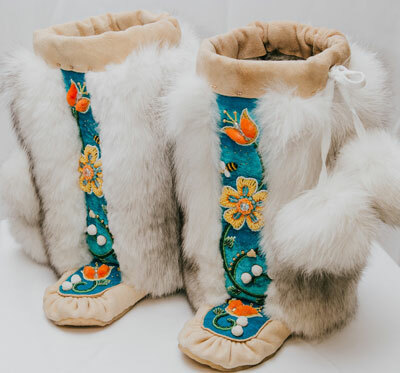 Image: Samantha Jacobs, Bee-utiful, 2018; brain-tanned deer hide, fox fur, silk velvet, glad beads, caribou fur, sinew; 12”x12”x12” each. Photo courtesy of Samantha Jacobs. Velvet is one of the most luxurious textiles that has been produced in Europe and elsewhere for at least one thousand years. Despite the fact (or perhaps because of it) that it is very expensive to make, in both time and raw materials, velvet became an essential item for any self-respecting royal court or church in Europe and is now made and used in many places throughout the world. The Velvet! exhibition features over 100 garments and textiles, dating from the late fifteenth century to the present day. 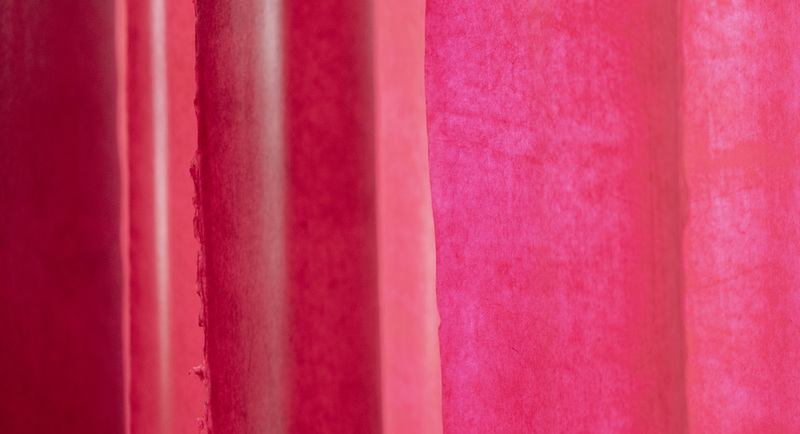 This feast for the senses features velvet samples of cotton, linen, mohair, silk and wool, velveteens, kuba velvets, children’s garments and wedding dresses, plus a wide range of velvet hats. For a brief introduction to the subject of velvet, please click here. For the complete list of objects that are being displayed, with direct references to the TRC online catalogue, click here. Image: No. 46. 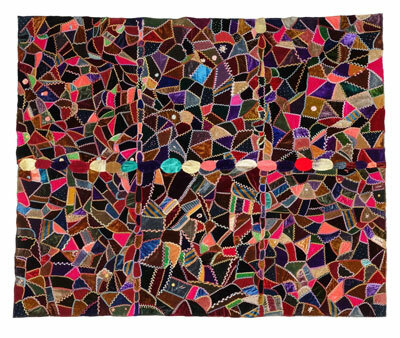 Part of a velvet ‘crazy quilt’ made from various types of velvet (1890’s, USA; TRC 2018.2407). 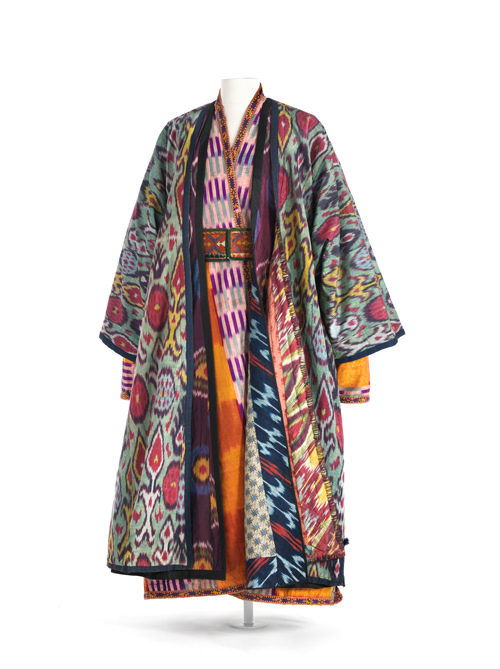 Over sixty Central Asian ikat robes and wall hangings from the Silk Road area of Kazakhstan, Kyrgyzstan, Tajikistan, Turkmenistan, and Uzbekistan, are featured in this exquisitely rich exhibit. It examines how the region’s designers, dyers and weavers used improvisation and abstraction to create textiles unique to Central Asia. For thousands of years, the Silk Road was the center for commerce—textiles being some of the most highly prized and traded, particularly the woven silk ikats. 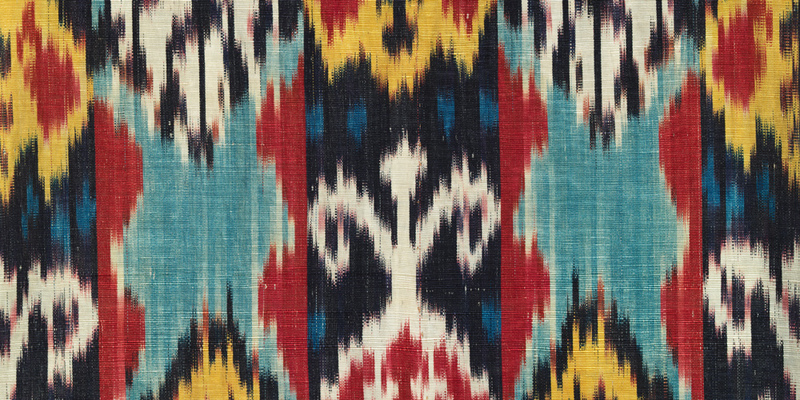 During the 19th and 20th centuries, ikat underwent a renaissance in Central Asia. 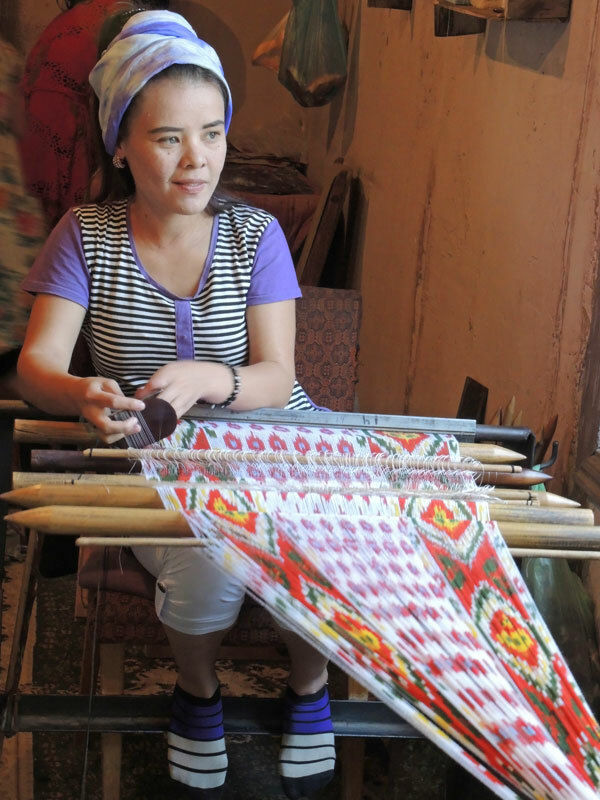 Artisans from these oases towns experimented with motifs and colors traditionally found on decorative objects producing sophisticated and complex luxury fabrics for their patrons. 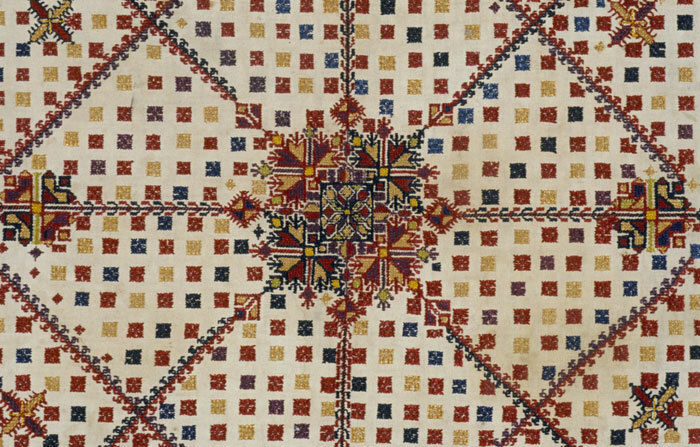 Whether worn on the body or used to decorate the home, these textiles resonated against the Central Asian landscape. Detail of Boy’s Kimono; Child’s Kimono, Japan, c. 1931-45. Collection of the Ruth Funk Center for Textile Arts, Florida Institute of Technology, 2014.13.08 and 2014.13.27. 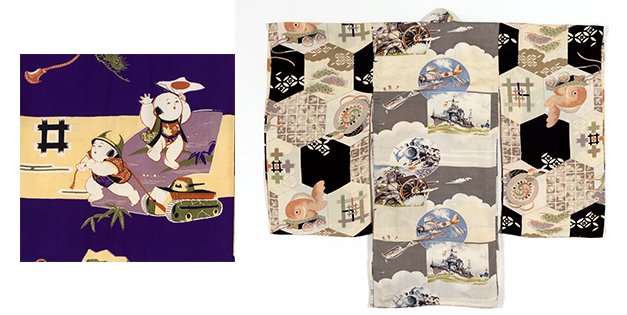 This exhibition features over 75 historic textiles which focus on the iconography, motifs, and metaphors displayed in objects manufactured as propaganda during the World War II era – also known as the Asia-Pacific War (1931 – 1945). Produced within a nation primed to advance its cultural identity on the world stage, textiles provide an important lens for understanding the role of consumerism, coercion and fashion during a remarkable and controversial period of transition. Curated exclusively from the Center’s permanent collection, this exhibition presents kimono and associated textiles from one of the most distinctive periods of textile production in Japanese history. Dress, Spring/Summer 1995, by Yohji Yamamoto (Japanese, b. 1943). Silk/rayon-blend jersey and polyester/rayon/nylon-blend brocade. Collection of The Kyoto Costume Institute. © The Kyoto Costume Institute, photo by Takashi Hatakeyama. In the early 1980s, Japanese avant-garde designers took Paris by storm, disrupting the world of haute couture with their minimalist, deconstructed clothing. But this was not the first time that Japanese design principles had transformed international fashion. 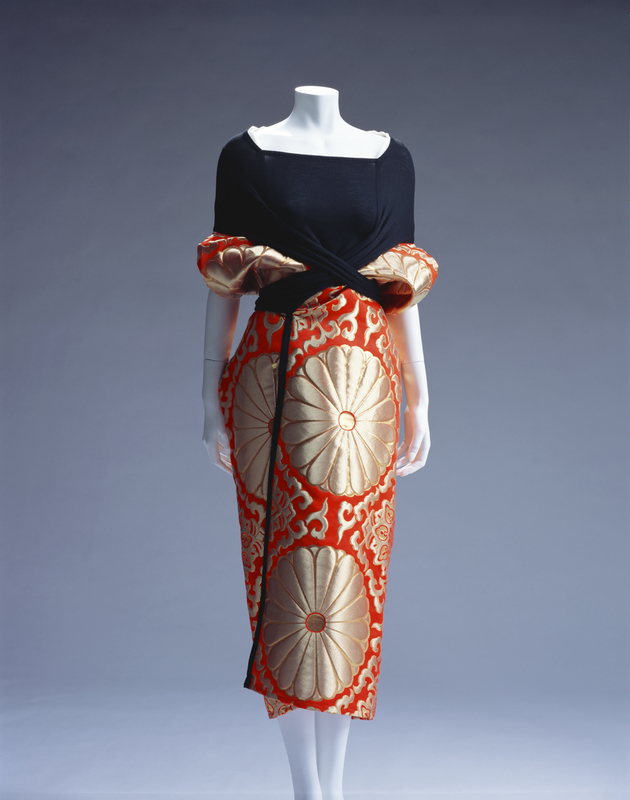 Instead, as Kimono Refashioned reveals, kimono, its materials, forms, techniques and decorative motifs, has inspired designers for more than 150 years. Featuring over 35 garments from the Kyoto Costume Institute, this exhibit shows how the kimono continues to be a fertile source of ideas for contemporary designers. People make quilts throughout India. 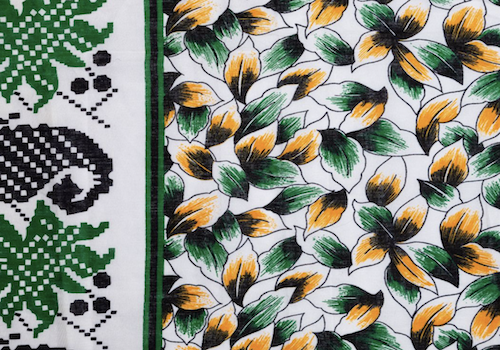 These diverse, beautiful textiles represent a wide range of geographical, ethnic, and social groups, and help tell the stories of their individual makers. Drawing from intensive field work and interviews, this exhibition introduces a group of quiltmakers from villages scattered across the western Indian states of Gujarat and Maharashtra. 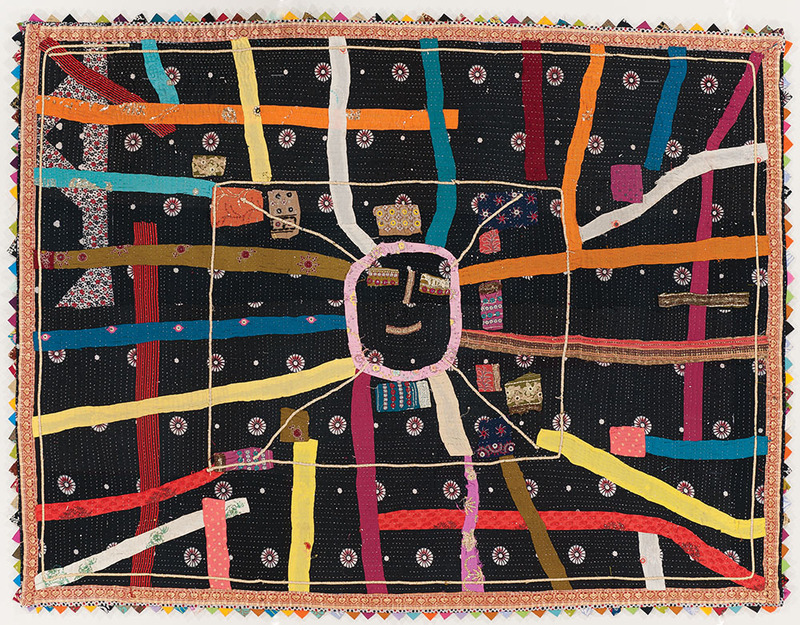 Their stories afford insight into the quilts themselves, and both objects and text help viewers appreciate the lives of women in this part of the world. 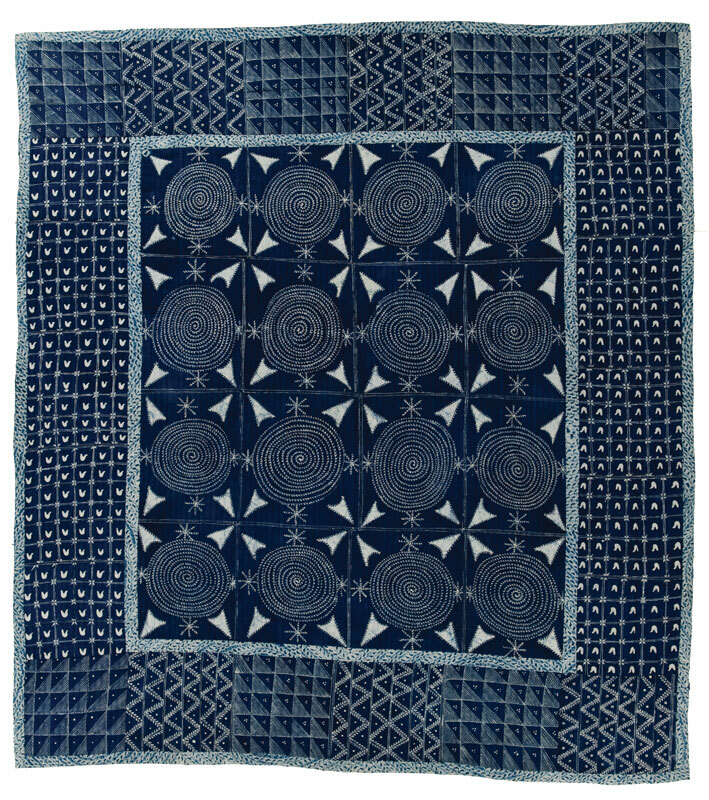 Adire cloth quilt, made by the Yoruba people circa 1990-2000 in Nigeria. In Africa, fabric is useful, valuable, and symbolic. It speaks to identity, group affiliation, and prestige. It is colorful, patterned, and visible everywhere: at community gatherings, in the marketplace, and in the home. The ubiquity of fabric means that few forms of material culture can compete with it for status. 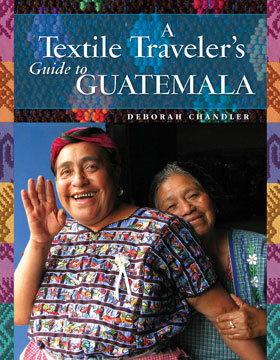 This exhibit encompasses an array of stitched textile techniques such as patchwork, appliqué, and quilting as well as woven and printed ones. Kente cloth from Ghana is made by sewing long, woven strips together to create large fabrics for garments. Kuba cloth from the Democratic Republic of the Congo is a ceremonial raffia fabric constructed using a number of techniques, including patchwork and appliqué. Masquerade costumes from Nigeria feature plentiful stitchwork, and enable villagers to “transform” into spirits during rituals and festivals. 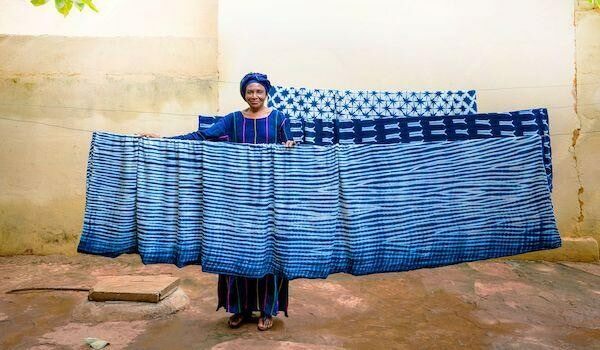 Today, entrepreneurial artists have created hybrid styles, such as Nigerian tourist items that combine the American quilt format with traditionally dyed fabrics. Appliqué skirt panel, made by the Kuba people, circa 1950-1980 in the Democratic Republic of the Congo. IQSCM 2018.045.0011. Maiden spirit masquerade costume made by the Igbo people circa 1950-1970 in Nigeria. IQSCM 2018.045.0009. Kente cloth made by the Ashanti people circa 1960-1980 in Ghana. IQSCM 2018.045.0004. This exhibition is dedicated to showcasing this collection and telling the story of His Majesty King Chulalongkorn’s three trips to Java and his fascination with batik. It presents exceptional examples of batik from His Majesty’s collection which have never been publicly displayed. Who goes on the Silk Study Tour to Japan? Artists, makers, educators, life-long learners, writers, textilians, historians, Japanophiles, and those wanting to learn more deeply about silk and Japan. In this sixth excursion of the Silk Study Tour, the focus remains to foster a continuous thread of communication and education with Japanese silk masters, educators, and artisans that will lead each traveler into a new fiber future. It offers future exchanges of silk information and provides teaching and marketing opportunities on both sides.See traditional Japanese sericulture practices on a farm, visit indigo dyers, and try your hand at katazome. 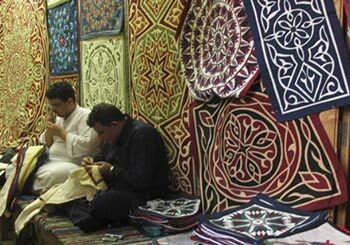 Cloth was, and continues to be, a unifier across the Islamic world. Four Corners of One Cloth: Textiles from the Islamic World showcases textiles from the Whitworth’s collection, selected from across cultures and countries.The title refers to the Prophet Muhammad bringing together four leaders who all wanted to raise the sacred Black Stone from the ground up to the Ka’ba in Mecca. They placed the stone in the center of a cloth so that each could take a corner and lift together. At the heart of this exhibition is a nearly 100-year-old fragment of kiswa cloth. The kiswa covers the Ka’ba and is replaced annually during Hajj (pilgrimage to Mecca); each year sections are cut and distributed across the world. While this is a textile of religious significance, other are textiles offering protection–a Dervish hat stitched with a poem to recite, a Malian hat that is said to contain passages of the Qur’an and a talismanic shirt with a magic formula of letters and numbers. Beyond the textiles used in ceremonial ways are ones of everyday use. Socks, rugs, bedding and tablecloths are included, as are pieces by designers William Morris, Thomas Wardle and Lucienne Day, clearly inspired by Islamic culture. Fabric Africa is a stunning snapshot of the diversity of modern and historic textiles from across the continent of Africa. The selection of textiles and clothing dates from the late 1800’s to the present day and come from Nigeria, Ghana, Kenya, South Africa, Sudan, Mali and Swaziland amongst others. From mud cloth to adinkra, barkcloth dresses to kanga cotton prints, ‘royal’ kente cloth to huge embroidered agbadas, this exhibition gives a taste of the amazing ingenuity of the textile artists of Africa and explores the importance of cloth in social and political lives of those who wear them.